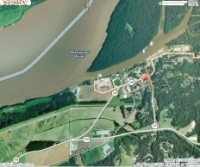 The Hickman-Fulton County Riverport is located on the Mississippi River in western Kentucky, at latitude 36° 34’ 09” and longitude 89° 12’ 22”. Our port facilities are on Kentucky Highway 94, with additional access routes via Kentucky Highways 125, 166 and 309. The Riverport is 20 miles from U.S. Highway 51 and Kentucky Purchase Parkway. Highways 51 & Purchase Parkway are both 4 lanes and officially designated the Future Corridor for U.S. Interstate 69. Highway I-69 will run from the Canadian to Mexico borders. For updated and current I-69 information Click Here.